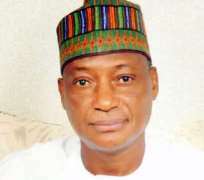 The Minister of Defence, Brigadier-General Mansur Dan-Ali (retd), has denied an online media report credited to him that Boko Haram insurgents still controlled two local government areas in the North-East. The minister stated this in a statement issued in Abuja, on Wednesday, by Colonel Tukur Gusau, public relations officer in his office. He also denied reports in the same medium credited to him that the abducted female students of Government Secondary School, Chibok, were being used as suicide bombers. According to the statement, the minister was quoted out of context, as he did not imply what was reported by the online medium. 'The minister was a guest in the studio of Voice of America, where he spoke in Hausa language on the appraisal of the successes recorded in the ongoing war against terrorists in the North- East. 'He said that before now, over 60 local government areas were under the occupation of Boko Haram in the North-East, but now only two were having some remnants of Boko Haram activities and not under their complete control. 'On the issue of the Chibok girls, the minister was not referring to the girls abducted on April 14, 2014 from Government Secondary School, Chibok. 'Rather, he was referring to other girls abducted by the terrorists from the local government areas and environs,'' the statement quoted Gusau as saying.